Elevated between 3976 ft and 10745 ft, the Ski Resort is among the 5 highest elevated Ski Resorts in Italy. The vertical drop from summit to base is 6768 ft. The average difference in altitude between base and summit of Ski Resorts in Italy is 3087 ft. Most runs are therefore relatively long. Monterosa is among the 3 best rated Ski Resorts in the Aosta Valley. It is among the 5 most family-friendly ski Resorts in Italy. Season starts on Nov 30 and ends on Apr 22 (143 days). Average season duration in Italy is 130 days. Average snow depth during the season (Nov 30 to Apr 22) is 40 " at summit elevation and 5 " at base elevation. Snow coverage is usually best during April, offering an average snow depth of 54 " at summit elevation and 13 " at the base. Therefore Monterosa is among the 3 ski Resorts with best snow conditions in Italy. Monterosa features 86 sunny days on average per season. The average for all ski Resorts in Italy is 88 sunny days. March is the sunniest month with an average of 24 sunny days. Offering 109 miles of slopes and terrain, Monterosa is among the 10 largest Ski Resorts in Italy. Monterosa ski area gives you three valleys´ ski resorts at your disposal. First there is Ayas Valley. The ski resorts Champoluc-Frachey, Brusson and Antagnod form part of Ayas Valley. Each ski resort has its special feature. 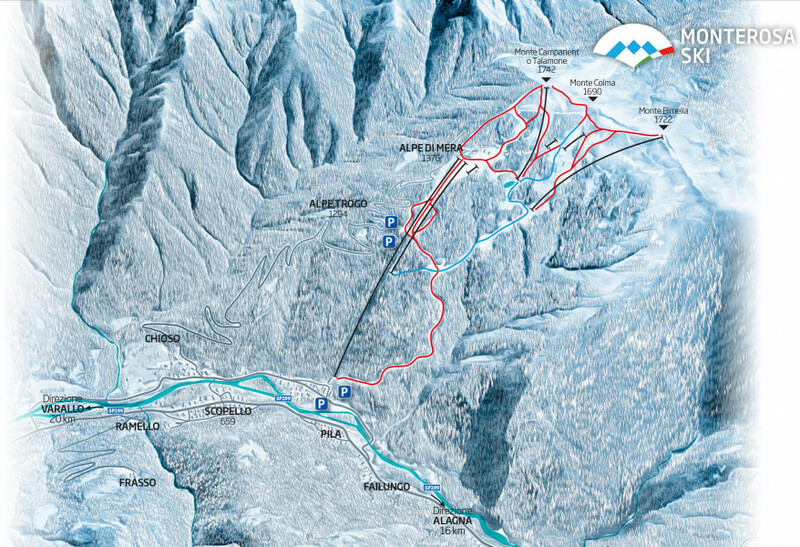 Champoluc-Frachey is particularly interesting for advanced skiers as there are about 50 kilometers of red slopes. Brusson is well-known for its international biathlon and cross-country skiing competitions, whereas Antagnod distinguishes itself from the other ski resorts with its highly specialized friendliness towards families and kids. At the eastern edge of the Monterosa region lies Valsesia Valley. Its ski region Alagna is a true jewel of freeriding and ski routes. 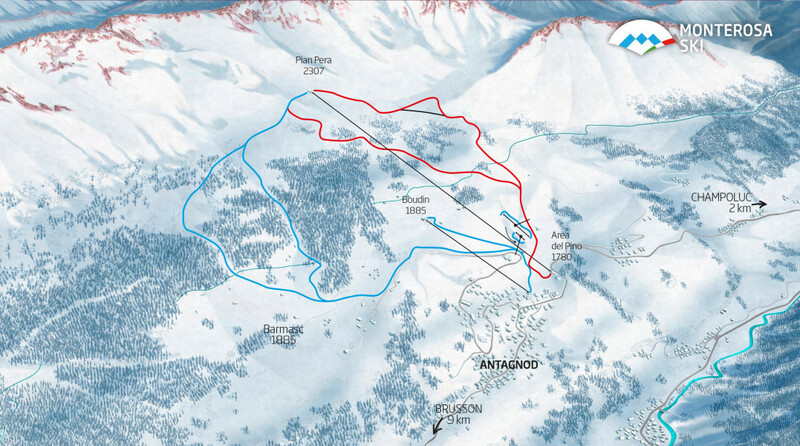 As soon as you´ve reached Passo Salati at an altitude of 2971 meters you´ll have plenty of descents off the pistes. For experts it truly is the El Dorado of freeriding. The third valley is situated between Valsesia and Ayas Valley: the Gressoney Valley. 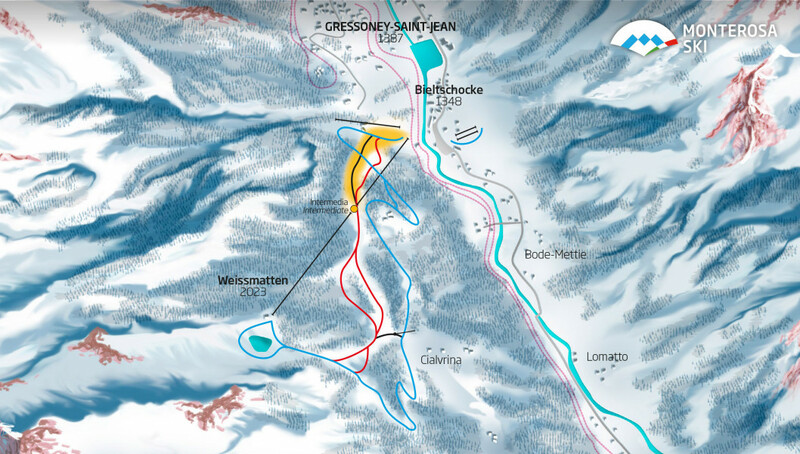 There are two ski resorts in Gressoney Valley, Gressoney-St-Jean and Gressoney-La-Trinité. The most remarkable feature about Gressoney-La-Trinité is its interconnection to the other valleys. 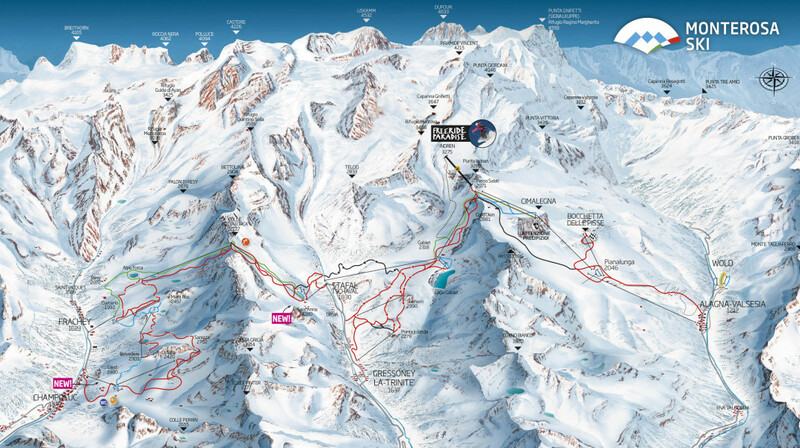 From here you can take various descents to the ski resorts of Champoluc-Frachey and Alagna. Gressoney-St-Jean is a little away from the region´s ski resorts. Nevertheless, this is not a disadvantage. This ski resort is more tranquil than the others, a perfect condition for beginners and cross-country skiers. But even experts will find their way to Gressoney-St-Jean. Everybody wants to try out the famous ski world cup slope Leonardo David. 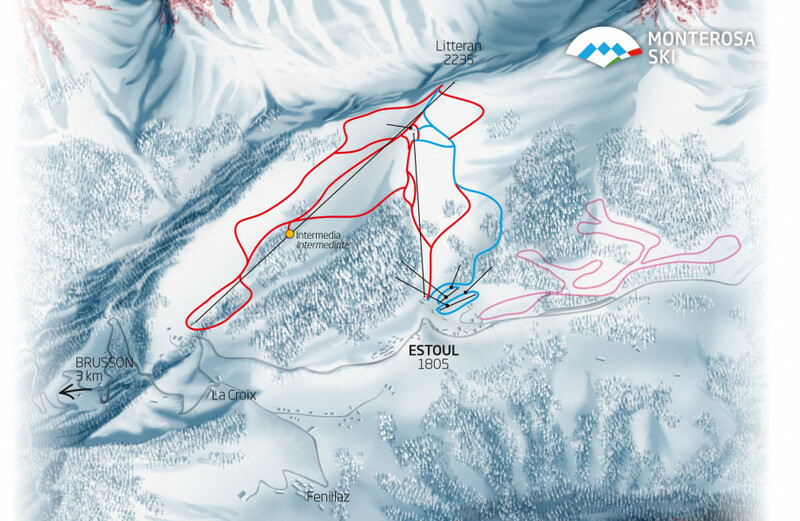 Nightskiing is possible at Gressoney-St-Jean, where the famous Leonardo David run can be lit. Alagna è il paradiso del freeride. The ski area Monterosa is located about 60 km northeast of Aosta. From there take the SS26 to Saint Vincent and then the SR33 to Brusson. 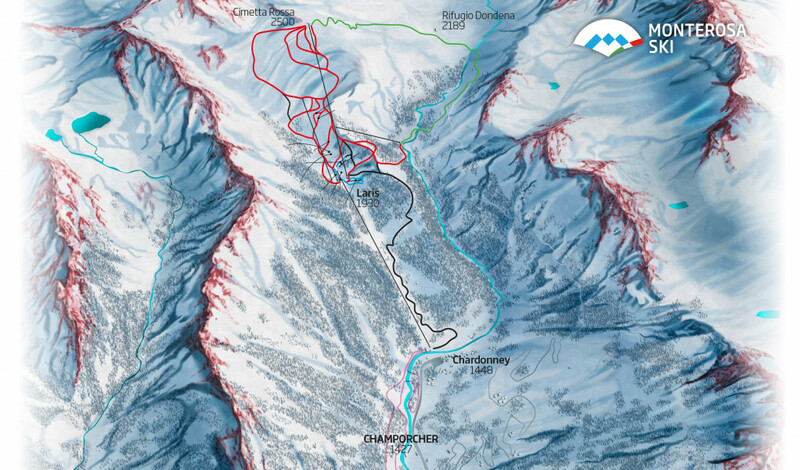 On the SR45 you get to the ski resorts Antagnod and Champoluc-Frachey. If you want to reach the Gressoney valley, follow the SS26 to Pont-Saint-Martin and then take the SR44 to Gressoney-Saint-Jean and Gresonney-La-Trinité.